Ten Days to Black Freedom! Free Marissa Now East Bay Caravan! Marissa Alexander is a survivor of domestic violence from Jacksonville, FL who was prosecuted and threatened with 60 years in prison for defending her life from her abusive husband. After serving a sentence of 3 years behind bars and 2 years in house detention while being forced to wear and pay for a surveillance ankle monitor, Marissa Alexander was finally released on January 27, 2017. This site is an archive of The Free Marissa Now Mobilization Campaign. Learn about Marissa's new project, The Marissa Alexander Justice Project, and FMN's ongoing work with our partners at Survived & Punished. After 3 years behind bars and 2 years of house detention, Marissa Alexander was finally released from state confinement. Marissa Alexander has been punished for over 5 years for defending her life from a domestic violence attack threatening her life nine days after she gave birth. 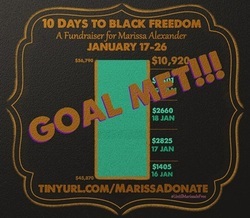 The Free Marissa Now Mobilization Campaign is thrilled that we have finally made it to the day that we can say Marissa Alexander has her freedom. We are honored to share this statement from Marissa and her family: "We are grateful to God that this chapter of Marissa's life will come to a close on January 27, 2017. We are sincerely thankful and appreciative to all who rallied, supported and prayed for Marissa's release. 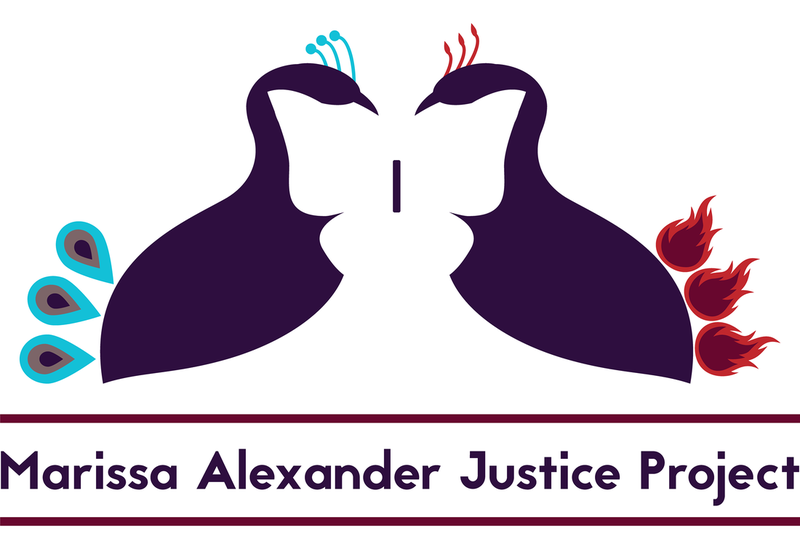 As she enters a new chapter, with endless possibilities, we ask that you will continue to support Marissa through her non-profit organization that was established to end domestic violence and injustice in the criminal justice system, The Marissa Alexander Justice Project. Without you, today would not be possible. Thank you again and again." To honor & archive this important activism, we ask all people who did an action to help free Marissa Alexander to PLEASE FILL OUT THIS SURVEY so that organizers and survivors can learn and build from it in future movement building. NOW AVAILABLE: Our partner, Survived and Punished, has released a downloadable toolkit ​for organizing defense campaigns for criminalized survivors of violence! ​#SurvivedAndPunished: Survivor Defense as Abolitionist Praxis is a collection of tools, tips, lessons and resources developed through grassroots campaigns to free survivors such as Marissa Alexander, Nan-Hui Jo, Kelly Savage, Eisha Love, Bresha Meadows, Ky Peterson, and many others. Marissa Alexander On The Move(ment)! After 3 years behind bars and 2 years of house detention, Marissa Alexander was finally released from state confinement!!! Read Free Marissa Now statement. ​This project is organized in coalition with the following freedom campaigns and organizations: Stand With Nan Hui, Love & Protect (formerly Chicago Alliance to Free Marissa Alexander), and California Coalition for Women Prisoners. We demand the immediate freedom of those who are punished for surviving domestic violence and other forms of gender violence, including Marissa Alexander! "I wrote this poem because of my support of Marissa Alexander. I wrote this poem one morning because of my outrage that I still live in a country where it seems as though black women are still having to defend themselves about defending themselves." Organizers from ‪#‎BlackLivesMatter‬ and ‪Free Marissa Now discuss how black women are targeted by state violence.